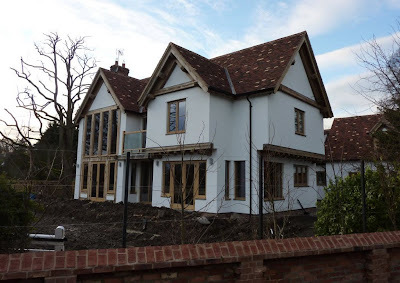 One of many houses we have currently under construction by clients in and around Cambridgeshire……. nearly done and looking great! 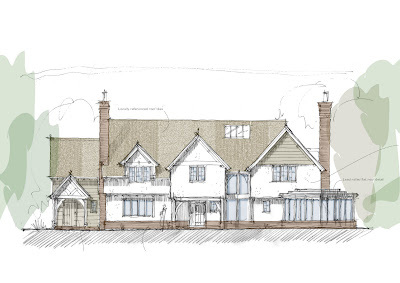 This project involved gaining Conservation Area Consent for the demolition of the existing dwelling on site and then Planning Approval itself for the construction of the new dwelling. It was a fairly lengthy process but well worth it as the photos show. The plot is within a very attractive Cambridgeshire village with frontage onto the village green and side facing elevation onto the River Cam so absolutely stunning! 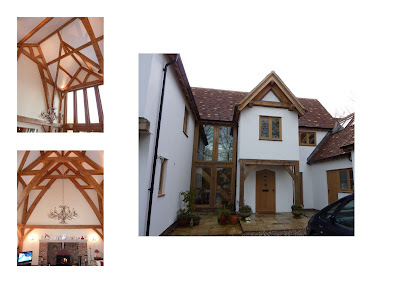 This was another joint project between PJT Design and T J Crump Oakwrights Ltd who did their usual excellent job of bespoke oak frame design, supply and erection together with some of the external thermal skin wrap. Congratulations go out to our clients and we wish them many happy years in their dream home. 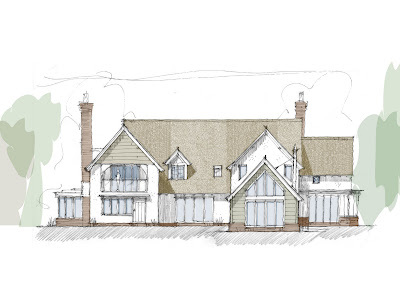 NORFOLK COUNTRY HOUSE PRE-APPLICATION PROPOSALS LOOKING GREAT…. Really happy with this design…..
Just going into pre-application negotiations now with the local planning authority, South Norfolk Council. This method of presenting the scheme ahead of a formal application will allow the planners, conservation officers and local neighbours etc all to have a say in principle to the proposals so that the ultimate formal application can be adjusted as necessary prior to submission. This design blends modern contemporary open plan family living spaces together with classic local architectural vernacular such as narrow gables, steep roofs, additive forms rather than subtractive and an apparent randomness to fenestration and detailing. If the council are as positive about the design as we are then we should be able to get this into formal planning in the next month or so…. Well, in between designing others peoples houses, me and the missus have as good as finished our kitchen extension! Yes, it took longer than it was supposed to and Yes, it went over budget….. but was it worth it? Most definitely and categorically………… YES! We really enjoyed this part of the house renovation project (now in year 7 by the way) and it is pretty much the last thing we need to do apart from landscaping so days of twiddling thumbs ahead and thinking about the next project! Thanks to all the people involved in making it happen for us. A PLANNING DECISION WORTHY OF CELEBRATION! What a result this one has been….! This is a project we took on about a year ago. 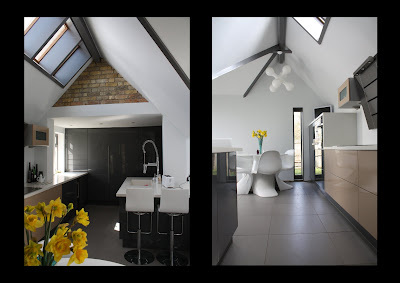 Its a replacement dwelling on a plot in a sleepy Buckinghamshire village. Its actually one of those dream plots you encounter from time to time…. really special. 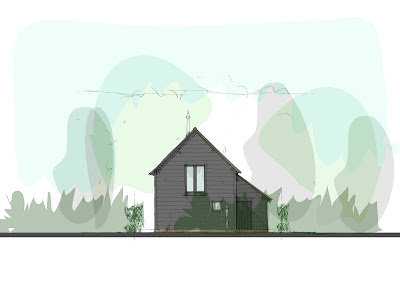 The plot is in an Area of Outstanding Natural Beauty and borders Green Belt so it was always going to be a tricky one. 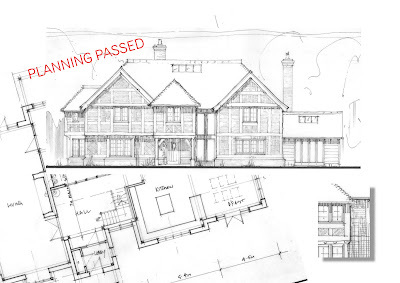 However, after a year long design and planning process, we end up getting planning permission granted one week ahead of the decision date and it was decided that it was not necessary to take it to committee and it was passed at officer delegated level.!.. this would most definitely be called a “result” in my book! Its going to be another Oakwrights frame so of course will look amazing. Loads of great stuff on here from the HB&R crew…..
One of clients asked us to do some artwork images for a barn we got planning on at the end of last year and we produced these…. i think they blend a nice balance of freehand pen work with pc work over the top…..